Cauliflower is one of the many cabbage related cole crops that revels in cool weather. Mark Twain called it "A cabbage with a college education. ", but we don't think it's just cabbage with airs. Cauliflower has a very distinct nuttiness, closer to broccoli in flavor. The main edible part of both cauliflower and broccoli is the flower bud, making them both edible flowers. 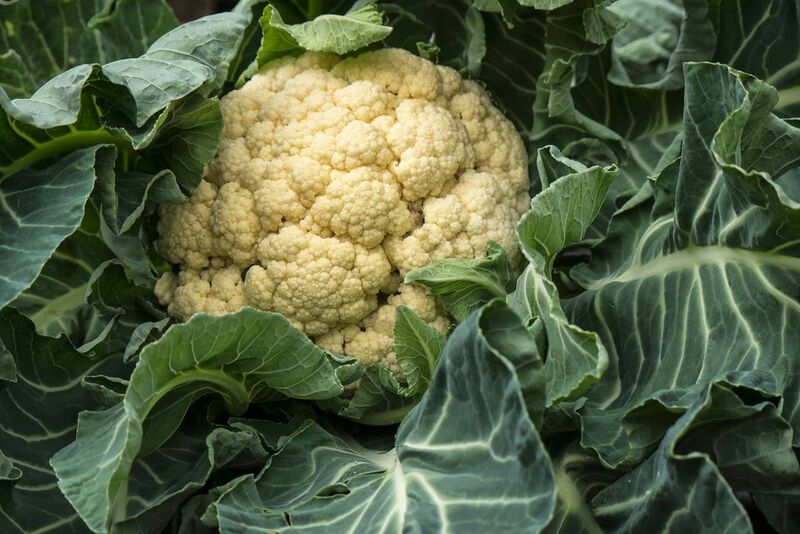 Cauliflower is not the easiest vegetable to grow, because it is very sensitive to temperature changes, however with a little TLC, it can be a very rewarding vegetable for your garden. You'll have many more variety options if you start your cauliflower from seed. The white varieties need to be blanched, by covering the head with its leaves. The purple varieties get their color from anthocyanin, an antioxidant. Unfortunately, both the color and the benefits disappear with cooking. And a happy accident leads to the orange cauliflowers, which have a higher percentage of beta-carotene. Leaves: The thick, oval leaves have a pronounced mid-rib and veins. The leaves and stem of cauliflower are both edible. Flowers: The cauliflower head is composed of tightly packed flower buds, often referred to as curds. The actual flowers of the cauliflower are the familiar 4 petals in a cross shape that give this family of vegetables the name cruciferous. Cauliflower plants are biennial, although they may bolt to seed in their first season because of weather fluctuations. However, if you want to save seeds, you will need to leave some plants unharvested, perhaps over the winter, with some protection from the cold. Plants will grow best in full sun, although a little partial shade might prevent plants from bolting or budding (forming small, button-sized heads), in warmer weather. The size of the head will depend on the variety you are growing, but average between 6 to 12 in. Most cauliflower varieties require about 2 months to mature, although some are a little quicker and others can take up to 3 months. Since they will not form heads in warm weather and can only handle a light frost, be sure to choose a variety that will have enough time to mature in your climate. That means a fast maturing variety if your spring or fall is short. Longer-maturing varieties are good choices for gardeners with mild or late winters. Gardeners in cold climates often have better luck putting out transplants in mid to late summer and harvesting in the fall. Harvest when the heads reach the desired size and while the buds are still tight. Don't leave them too long, or the flowers will open. It would be better to cut them when mature and freeze them for later use. Another option is to lift the whole plant and store it, roots, stem and all intact, in a cool, dry place. It seems plant breeders like to play with cauliflower because new varieties are always being introduced. Do some sleuthing at your local cooperative extension office, to find varieties that do especially well in your area. Soil: Cauliflower needs a soil rich in organic matter, with a soil pH between 6.0 to 7.0. The soil should be well-draining, but cauliflower needs consistent moisture, to prevent buttoning. Whether you are planting your own seedlings or some purchased from the store, be sure to harden off your transplants before setting them out in the garden. Space plants about 18 to 24 in. apart, to give the outer leaves plenty of room. Since cauliflower takes so long to mature, some supplemental feeding will be necessary. Feed every 2 to 4 weeks with an organic fertilizer like kelp and fish emulsion. White cauliflower will need to be blanched if you want it to remain white. The flavor isn't terribly altered if you allow it to turn its natural yellowish-brown, but it does seem to remain a little sweeter and a lot more appealing if blanched. Begin blanching the heads when they are about the size of a large egg. Start the process when the plants are fully dry, to avoid rotting. The traditional way to blanch is by folding some of the larger leaves over the head and tucking or securing them on the other side. You can hold them down with a rock or tie them in place. Don't fit the leaves too tightly; you want to block the light, but leave room for the head to expand. Once the leaves are in place, try not to get them wet and check under them periodically to make sure insects aren't using them as a hideout. If this sounds like too much effort, you can simply cover them with an overturned bucket. Or take an even easier route and grow one of the colored varieties. They do not need to be blanched. Insect pests: Unfortunately cauliflower is susceptible to all the usual cole crop pests, and there are many, including cabbage maggots, cabbage loopers, and cabbage worms. Young transplants are also attractive to aphids and flea beetles, especially if grown in the spring. Animal pests: Groundhogs are exceptionally fond of cole crops. Fencing or caging is the best deterrence. Diseases: Here again, the cole crops are problem prone, with blackleg, black rot and club root leading the pack. It's very important to not plant cole crops in the same place, year after year, and to clean up all debris at the end of the season, to prevent diseases over-wintering in the soil. Another common cauliflower problem is leaf tip dieback and distortion. This is generally caused by a lack of boron in the soil. Kelp or seaweed fertilizer should help prevent this. Orange cauliflowers have been bred from a genetic mutation that was discovered in 1970. The orange coloring occurred because it contains beta-carotene, like orange carrots. It's not a GMO, just a fluke that has been hybridized. You might see it marketed as 'Cheddar' cauliflower, but it does not taste like cheese. It tastes like a sweet, nutty cauliflower. Purple cauliflowers have been around for generations. There are several heirloom varieties, such as the popular 'Purple of Sicily', and some recent hybrids. They all get their purple color from the antioxidant anthocyanin, as does red cabbage, red grapes, and red wine. Unfortunately, most purple vegetables lose their color when cooked, and purple cauliflower is not ​an exception. This alien-looking vegetable is often referred to as 'Romanesco' broccoli, but it also frequently gets grouped in with cauliflower. It's probably a cross between the two and it is not the easiest vegetable to grow. It's worth a try, though. The florets develop in a fractal pattern. Besides being beautiful, it has a wonderful nutty texture and flavor. Why Does Cauliflower Grow Purple?